This Friday, I’ll post the cover reveal and release date for Destroy (The Blades of Acktar #3.5), but until then, I have another announcement. I set aside the first week of December and put together a few designs for Blades of Acktar fandom merchandise. I’ve seen other authors do this (and I’ve bought several things as a result because, let’s face it, fandom merchandise is so much fun). I thought about making the merchandise only available as part of a street team. I’ve seen other authors do this. But, I decided I don’t have the time right now to run a street team, not without taking away from the little writing and editing time I have. Besides, all of you essentially ARE my street team. You do such a great job of getting the word out. You all deserve a way to shout your love of the Blades of Acktar fandom. Right now, I have two sites where you can get Blades of Acktar merchandise. 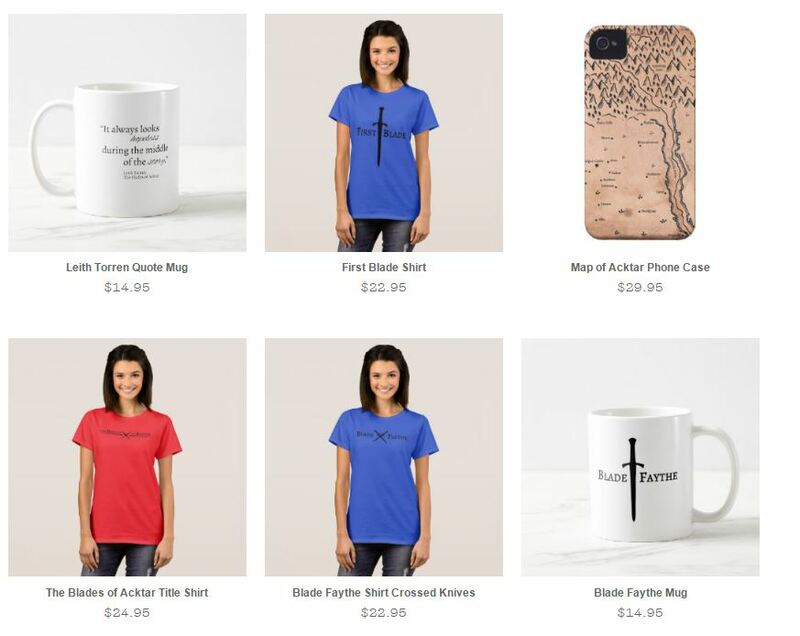 Zazzle.com – this one has more designs available since its rules on picture sizes are less strict and I had less trouble uploading designs. I believe I left most of the items as open as possible so you can customize colors and sizes. For the clothing, the women’s version is pictured, but they should all be available in youth and men’s sizes if you customize them. Society 6 – this one has more options for housewares items (such as pillows and clocks), but fewer designs available at the moment since this site demands higher pixel counts than Zazzle. Currently I don’t have any apparel set up, but I will be working on that in the future. I have personally purchased items from both of these sites before and have been pleased both times. Currently, both sites are running a lot of promotions for the holidays, which is always nice for saving money if you would like anything (or you can convince a family member to get it for you for Christmas). Have fun looking through the designs and options! Oh my goodness! I love it! I need to start saving my money, I want to buy it all! ;)My favorites are the t-shirt that with the “true courage” quote on it, and the notebook with “I would rather be God’s servant than your queen” on it.